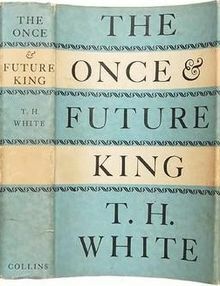 The Once and Future King is an Arthurian fantasy novel written by T. H. White. It was first published in 1958 and is mostly a composite of earlier works written between 1938 and 1941. The central theme is an exploration of human nature regarding power and justice, as the boy Arthur becomes king and attempts to quell the prevalent "might makes right" attitude with his idea of chivalry. But in the end, even chivalry comes undone since its justice is maintained by force. The title comes from the inscription that, according to Le Morte d'Arthur, was said by "many men" to be written upon King Arthur's tomb: the internally rhymed hexameter Hic iacet Arthurus, rex quondam, rexque futurus – "Here lies Arthur, king once, and king to be". A final part called The Book of Merlyn (written 1941, published 1977) was published separately following White's death. It chronicles Arthur's final lessons from Merlin before his death, although some parts of it were incorporated into the final editions of the previous books.